Five storey building marked for demolition at Kariobangi south collapses – Kenyatta University TV (KUTV). All Rights Reserved. A five-storeyed building has collapsed in Kariobangi South, Nairobi. Initial reports indicate that no one has been injured in the incident as the building was unoccupied. Nairobi County Lands and Urban Planning Chief Officer Rose Muema said the building had been marked for demolition. The tenants are reported to have vacated the building after it was marked for demolition. According to Kenya Red Cross, tenants were evacuated from the building on Monday after it started shaking. “#Building started shaking yesterday where occupants were immediately #evacuated. No #injuries or #fatalities,” Red Cross confirmed through their twitter. This comes a day after three people died when a wall fell on them at Brookside Villas in Westlands, Nairobi. The three were among nine men who had been digging a trench to divert a river. 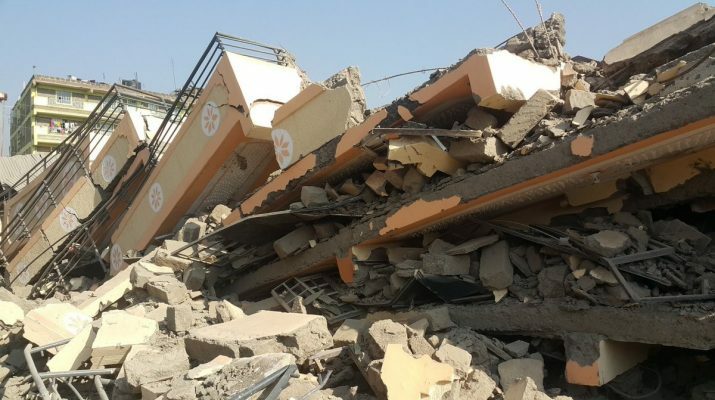 This year in April, another building collapsed in Huruma with Nairobi Deputy Governor Jonathan Mweke stating that over 70% of the buildings in Nairobi do not have government approval.